This activity includes 10 pages with 4 "cards" on each one. Each card has a picture of things associated with Spring. 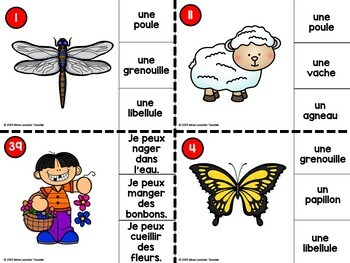 Most are animals, but some are weather and 4 are "Je peux..." sentences. The cards can be used as "clip cards" where children use a clothes pin to choose the correct answer, OR - if you choose to laminate them - they can use dry-erase markers to circle their answers. Another thing we did was have a "word hunt" around the school, where the students are given a blank cards with the numbers from 1-40 (included in package), and they roam the school looking for the cards, and writing the correct word on the corresponding line. This was an inclusive activity in lieu of an "Easter Egg" hunt, to include those children who do not celebrate Easter. 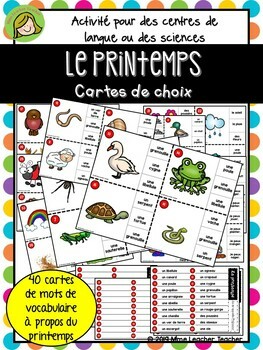 The sheet can be used in centres as well, if you would like the children to have a writing component. There is an answer key provided.